The warmer and more muted colour of Tea rose seems to suit my skin tone better and once again, the glitter top coat instantly made the nail varnish more girly and fun. 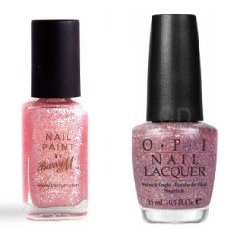 Unfortunately, I don't think you can get Constance Carroll polishes anymore, but Barry M pink iridescent and OPI teenage dream both seem like nice alternatives if you are looking for a glittery top coat. Love it, very pretty :). 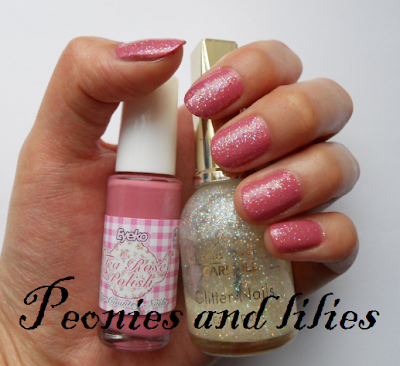 Ooh lovely girly nails :D the Barry M polish looks really good, I'd love to try that one out! Gorgeous nails, the Eyeko polish looks like the perfect pink. When I saw the title of this post, I was thinking "do they still sell Constance Carroll?" oh man, that brand takes me back to my teens, when weekends were spent buying the brightest possible shades of Constance Carrol we could find, either from the market or in Boyes! Aaw, the good old days! My mum still owns Constance Carrol eyeshadows, that she claims she bought in the sixties!!! Scary thought!